You often hear the expression “no place like home”, but when once you stay at the Aquamarine Hotel, you will reconsider! 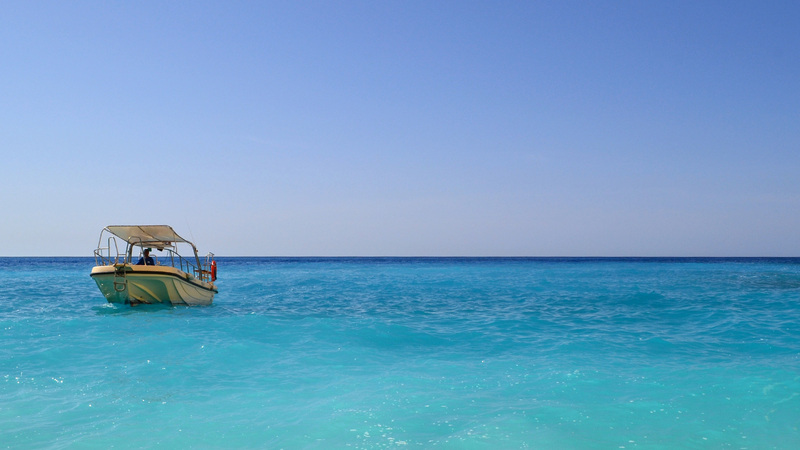 At the Aquamarine Hotel, your dream vacation does come true! The Hotel’s privileged location right next to the beach, the services, and the beautiful sightseeings that surround the location guarantee the most enjoyable and unforgettable vacation you have ever had! 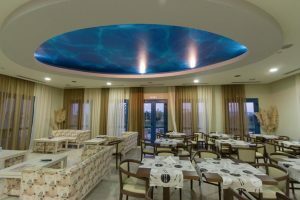 The Aquamarine Hotel is a charming beachfront resort with 21 rooms, and one Honeymoon Suite, all with balcony and sea view directly to the blue waters of the Mediterranean. In our Hotel, you will feel at home. Our rooms are spacious and have all the amenities you could ever ask for; hot water 24/7, mini-bar to store food and drinks, comfortable bed and fluffy pillows, and a balcony with a breath-taking sea view! 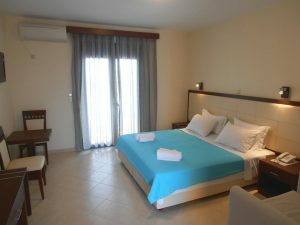 All rooms and Hotel’s main areas are fully air-conditioned and have free WiFi access. The Aquamarine Hotel is the ideal resort for all vacation types; from the most adventurous ones to those who prefer quiet vacation time. There are plenty of activities for those who love sports and numerous sightseeings to discover all around the area.The Aquamarine Hotel is also ideal for families. There is a playground in the garden for the Hotel’s little guests and baby cribs for the room that are available free of charge. Our Hotel is happy to offer further accommodation features for the guests who are searching for easy accessibility. 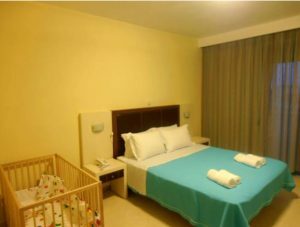 Fully equipped and functional rooms are provided for people with disabilities or mobility limitations. Our cuisine offers all you can ask for your breakfast! Handmade cake, freshly-baked bread, ham, cheese, marmalade, raw honey from local producers, fruit and a variety of other options to ensure that you will start your day full of energy and nutrients. 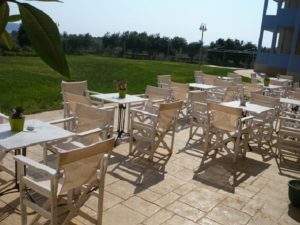 The Aquamarine Hotel has a large indoors dining area but you can also choose one of the outdoors tables to enjoy the fresh air by the sea. We also offer in-room dining services so you can enjoy tasty snacks while watching the beautiful sunset from your own room’s balcony! 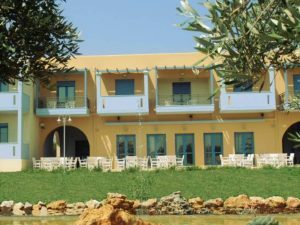 The Aquamarine Hotel is a beautiful resort by the beach, in a small village in South Laconia, called Kampos. 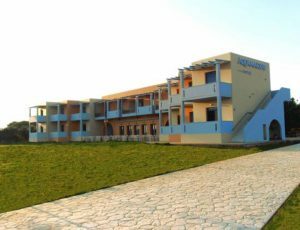 Kampos is a 10-minute drive from Neapoli, the central town of Vatika area. Within 1-minute walking distance from the Hotel, you can swim at Neratzionas beach, known for its golden sand and the blue Mediterranean water. Heading west, you reach two beaches of astonishing beauty, Magganos and Pounta. Not more than a 10-minute drive from Aquamarine Hotel, you can take the boat to visit Elafonisos island and one of Greece’s best beaches, Simos. Heading east from the Hotel, after a 10-minute drive, you reach Neapoli, a beautiful seaside town. The long beach offers numerous spots to swim while the restaurants, cafés, and bars along the coastline are a great opportunity to relax and enjoy the view. If you wish to explore the area further and get to know Vatika, we recommend visiting the villages located on the mountainside that surrounds Neapoli. Grab a cup coffee and take a mini-road trip to higher altitudes where you will be stunned by the magnificent view of the Mediterranean. Heading northeast, there is Monemvasia, a seaside town renowned for the Medieval Castle. The stone-built castle is very well preserved until today and you can visit any time of the day. Inside the Castle, there are restaurants, cafés, and shops. Allin all, the Aquamarine Hotel is in the perfect location; right next to beach and close to all the must-see destinations!